As temperatures plunged to minus 16 degrees celsius, hardy animal rights campaigner Ashley Fruno, peeled off down to just a white bra and knickers while waving a sign that read "champions don't wear fur" outside the Olympic media centre. Pyeongchang, South Korea: A half-naked activist sporting bunny ears and a fluffy tail braved the Olympic chill in Pyeongchang to protest the fur trade Tuesday but, shivering on high heels, side-stepped the thorny issue of dog meat. However, despite withstanding the bone-chilling cold for more than 15 minutes in her skimpy undies, she insisted People for the Ethical Treatment of Animals (PETA) had no plans to protest South Korea's controversial dog meat trade. "It's certainly cold out here, but it's nothing compared to what the animal go through on fur farms," she told reporters. 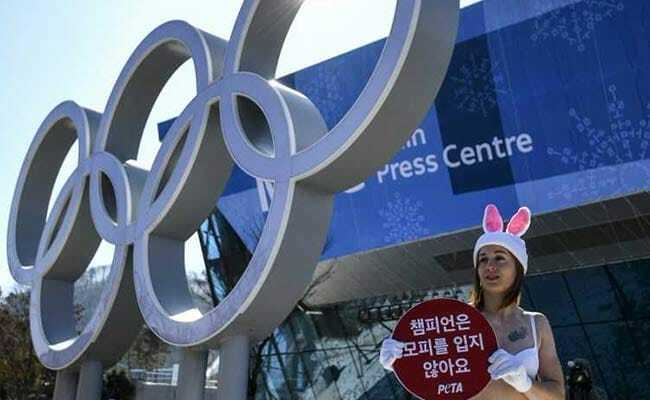 "Unfortunately fur is being worn by many Koreans and fur should not be seen at the Olympics. It's animal cruelty so we ask everyone here to please go fur-free. "With so many stylish and toasty alternatives to fur available, there's no excuse for harming a hair on a bunny's back." Animal rights activists have called for South Korea to stop eating dogs at previous major sporting events, notably at the 2002 World Cup when Brigitte Bardot fronted a campaign that provoked a backlash in the country. The government banned the sale and consumption of dog meat in the run-up to the 1988 Seoul Olympics out of concern the issue could embarrass local organisers. "Animal cruelty is animal cruelty, whether it's dog's or rabbits, minks or racoons," said Fruno, who admitted that being Canadian helped only a little in trying to beat the freeze in Pyeongchang. "We'll be speaking out about many issues while we're in Korea but we don't have a specific dog meat campaign planned." Nonprofit organisation PETA have sparked anger from women's rights groups in the past for stripping off to campaign for animal rights. "In Asia the fur trade is very large and China is actually one of the world's largest fur exporters," said Fruno. "On fur farms in China, rabbits are crammed into cages and killed by being beaten to death, strangled, or having their throats slit while fully conscious." Last year South Korea closed its biggest dog market Seongnam market, which sold more than 80,000 dogs, dead or alive every year to avoid criticism in the build-up to the Pyeongchang Olympics. The dogs are locked in cages before usually being beaten to death, because it is thought to boost the production of adrenalin that Korean men believe increases virility. Once dead -- or nearly dead -- the dogs are dropped into boiling water and skinned. Many cooks then use a blow torch to glaze the carcass.